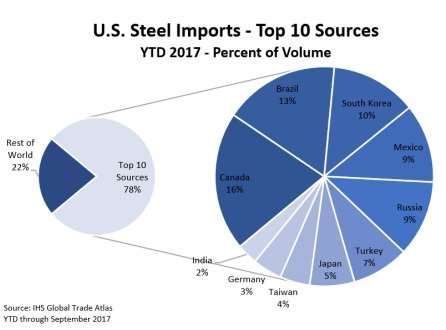 While much of what Trump is announcing today has already been leaked, here are the details of the import tariffs Donald Trump formally adopted on steel and aluminium imports which allow US allies to negotiate and apply for exemptions, a sign of the growing concern that the president was alienating America’s closest international partners, and that 2 of the 4 largest foreign suppliers of steel will be exempt. The tariffs will come into force within 15 days and are expected to draw retaliation from the EU and other steel producers and heighten fears of a descent into a trade war. During Trump's address, the president discussed specific countries, noting that the US is open to modifying tariffs for "friendly" nations countries. China - the US is negotiating but Trump says that while he has "great respect" for President Xi, he says "I don't know if anything is going to come" of talks with China. Canada and Mexico - the tariffs won't apply to these countries if a Nafta deal can be made. Therefore, they won't go into effect while negotiations are still going. The AP reports that Trump is also not going to apply tariffs even if Nafta is terminated but this was less clear in his press conference remarks. We'll have to look to his actual signed order. In short, tariffs but with notable exemptions, which begs the question: why did Gary Cohn quit again?